Explanation: Is that Venus or an airplane? A common ponderable for sky enthusiasts is deciding if that bright spot near the horizon is the planet Venus. Usually, an airplane will show itself by moving significantly in a few moments. Venus will set only slowly as the Earth turns. Still, the identification would be easier if Venus did not keep shifting its position each night. 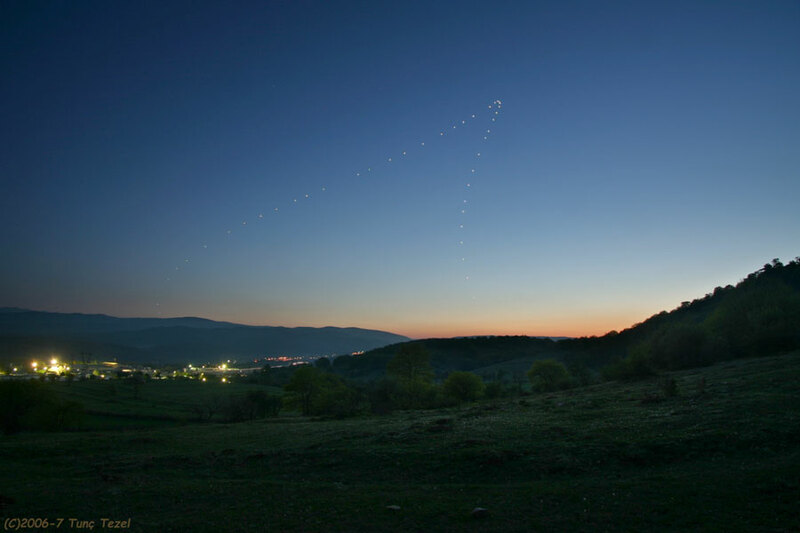 Pictured above, Venus was captured on 44 different nights during 2006 and 2007 over the Bolu mountains in Turkey, when Earth's sister planet appeared exclusively in the evening sky. The average spacing of the images was about five days, while the images were always taken with the Sun about seven degrees below the horizon. That bright spot toward the west in your evening sky this month might be neither Venus nor an airplane, but Mars.